To give myself a little blogging break I decided to try doing a post where I interview some interesting person whose insights my readers might enjoy. I immediately thought of Br. James Brent, a young man with a fascinating story of losing his faith only to find it again and realize he was called to be a priest. I hope you’ll enjoy hearing his thoughts on faith, doubt, finding your vocation and the priesthood as much as I have! My name is Br. James Dominic Brent, O.P. 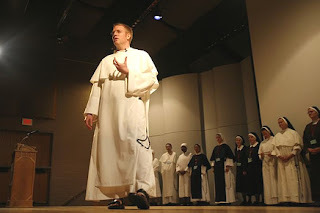 I am a Dominican Friar of the Eastern Province of the United States (the Province of St. Joseph). I was ordained a transitional Deacon in early January 2009. I live and study at the Dominican House of Studies in Washington, D.C., and I am assigned as a Deacon to St. Peter’s Catholic Church on Capitol Hill. I blog at dominicanfriars.org, the Dominican vocations blog. Q: Have you always had a strong faith? No. Although I was raised in a good Catholic family, and went through Catholic grade school and high school, and even believed what I was taught, when I was an undergrad I lost my faith. I went for four years without believing any of the Catholic faith at all. I think that is where a lot of young people are today. They find it hard to say that the Catholic faith is actually true. I’ve been there. I’m a weird case. Long before I joined the Dominicans, I finished a Bachelor’s degree in philosophy from a state school, then I finished a Master’s Degree in philosophy from a different state school. I then went to a Catholic school — Saint Louis University — where I completed all the requirements for a Doctorate in philosophy save the dissertation. I then joined the Dominicans. As a Dominican, I finished writing my doctoral dissertation in philosophy, and commenced theology and the other requirements such as canon law. At this point in history, Dominicans in my province tend to do an extra year (or two) of theology on top of the four required. I am making my way through theology now. Q: How did you know you were called to be a priest? The story of how I knew I was called to be a priest, and the story of how I lost my faith and found it again, are basically the same story. Finding one’s vocation and finding one’s God are the same movement of the heart. Discernment and conversion are two ways of looking at the same movement toward God. In my freshmen year of high school, I began to have a sense that God was calling me to the priesthood. I asked a teacher for guidance, and he gave me one of those prayer cards to “Know Your Vocation.” Over the course of several days, I sat in my bedroom and said the prayer on the card. And then it began. I can only describe it as the voice of my conscience haunting me. The voice of my conscience began to tell me, firmly, “Be a priest.” No matter what I told myself and no matter how much I protested (and boy did I protest) the haunting voice just continued to tell me over and over again: “Be a priest.” This went on for years. And those three words were extremely bad news to me. I was a young man, and now intensely interested in women and related matters. As high school went on, I began to party more and pray less. My faith dwindled. When I got to college, I threw myself into two things: partying and philosophy. The mix was a deadly cocktail for what little faith I had left, and within months of being in college I lost my faith entirely. I stopped praying, stopped going to Mass, stopped going to confession, stopped reading Scripture, etc. All I knew how to do anymore was party and raise adolescent kinds of questions about the existence of the external world. The philosophy of Descartes, and his method of doubt, indeed the enlightenment project generally speaking, is a most excellent means of silencing one’s conscience in the name of “reason.” And silence my conscience I did. Silencing it brought me temporary relief from the haunting voice. Doing so in the name of “reason” tickled my ego to no end. Whenever I thought of faith at all, the only question I could ask was “how can faith possibly be reasonable? what rational justification is there for believing this stuff?” These questions continued for years. After four years of partying, broken relationships, and rationalizing it all in the name of “reason, ” I became pretty conceptually and morally bankrupt. The prodigal son was waking up in the pigpen, and things were stinking up good. Certain books in philosophy triggered my wake up, and certain other books guided my way back to the Father’s house. I would be happy to talk about the sequence of books I read, and the philosophical points that cleared up a lot of my confusion. I think my story is testimony to the simultaneous greatness and wretchedness of philosophy. Philosophy can drag someone into hell, but it can also raise you up and set you down right in front of heaven’s door for you to knock. The search led me one day, in my last year of undergrad, to go to confession to a priest for the first time since early high school. Let me tell you, when that priest made the sign of the cross over my head, and said the words “I absolve you from your sins in the name of the Father, and of the Son, and of the Holy Spirit, ” something happened in me that remains ineffable. Even the term “experience” is inadequate. I cannot describe it except as Jesus does: “if anyone believes in me, out of his heart shall flow rivers of living water” (Jn. 7:38). The sacrament of penance was the turning point. About a year later, when I went to graduate school in philosophy, I was a freshly converted (or reverted) Catholic, but I ended up in a department that was very atheistic. As divine providence arranged it, though, down the street from my office was a Parish run by Dominican Friars. Only this time, atheism and agnosticism, was no longer a possible response. I had been there, done that. I had tasted life with no conscience except one of my own making, and I wanted nothing more to do with it. Actually, I should say that I had tasted death, that is, life without faith. So, I had to face what still seemed at the time to be pretty much the worst news I could imagine: “Be a priest.” It took me about three more years to say yes, and three more after that to enter. In his providence, however, God used all those years to prepare for things down the road. Thank you to Br. James for taking the time to answer my questions, and be sure to stop by the Dominican vocations blog at dominicanfriars.org! « Let’s talk about small houses! Wow, totally cool! Thanks Jen. I can’t wait to read the rest of this. I’m still looking for my own answers, but I love reading stories about how other people have found their faith. The lack of cynicism and overall hopeful tone are very compelling. Wow… this speaks directly to me. I love that part about how “God used all those years to prepare for things down the road.” I can’t wait to read the rest. Wow! This is great – thanks! Can’t wait to read more. This is wonderful – I too lost my faith in college, so his story really resonates with me. I can’t wait for part II. Thanks for posting it! I never knew that priests had to go to college. I always assumed that the priesthood was an apprenticeship type of education. I find it encouraging to read stories of people who regain their faith, particularly post college. I know of too many people who lost their way in their pursuit of higher education. Oh, wow, awesome story! I can’t wait to read Part II! …and given my own discernment issues I’m so glad to know how many people pull through them!! Wow, great post! I’m a Cradle Catholic, but wasn’t raised as anything. Spent my youth as an avowed athiest. In college I found Christ and my long lost Catholicism through friends and my future wife. Eventually my mom returned to the Church and my dad converted. I should in part thank the Gideons for handing out those mini New Testament and Psalms on campus. I took one and began to read. We even ended up reading Matthew and Acts in Humanities class, thanks to Dean Michaels, our Professor. After that I was a Christian and eventually Roman Catholic again. Congrats on your new child!! My favourite priest ever lives at the Domincan House in D.C. and he says Mass where I live once a week and special events . . . Father Willoughby. He’s been a very good and kind and generous confessor, not to mention, he reminds me so much of my late grandfather. I can’t wait for part II. Excellent part I!!! Glad you’re taking a break. Will miss your personal insights, though. Praying for your spirit to be lifted above demands, drudgery, and diapers. I LOVE conversion stories!! Keep’em coming! Wow, that is great! Thanks Jen! I am looking forward to Part II! An amazing story — can’t wait to hear the rest. I love Br. James Brent!!! I remember the first time I met him was at the Dominican House. What a great guy! He has helped me so much in my vocation! I became Catholic because of those brothers at the Dominican House!!! In June 2007, while attending the CMAA Colloquium at Catholic Univ., I was fortunate to have a 3rd order Dominican (layperson) as my roommate. She took me over to the Dominican house to participate in morning prayer before breakfast one morning… wonderful! This is so encouraging. I too became a Christian having walked years on the other side and too with a deep attraction to philosopy and hard questions. Now as a Christian I hope I bring a strong combination of that experience to what I do today. A protestant reader in New Zealand. I just stumbled upon your blog, and I have been reading since yesterday. I, too, am one of the ones who has doubts. Perhaps its the suffering of children I have seen over and over. Cancer, car wrecks. How could God do this? But the Bible says not to question Him. And, if God already knows what He is going to do, then why do we pray? I read that praying has changed your life, but not mine. Not that I really “need” anything – I am not asking for anything but for Him to come into my life and be a part of who I am. For my children, for me, for my husband. But, emptiness. I read the beginning about “just go with it, do it” and see what happens. I need to read more to even figure out how to do that. Thank you for the book advice, I ordered several. Any advice is appreciated, I actually feel rather desperate at this point. Did God direct me here for a reason? Or am I just fooling myself? It’s great to hear from you. I’m glad you found my blog. I’ve had similar questions about prayer — the comments to this post might be interesting to you, and some of the excerpts in this post might be some good food for thoughts. Also, feel free to email me! My address is on the left here. I’d love to hear from you. Keep asking the questions you’re asking. You’re on the right track. What does it say, then, that the haunting voice of my own conversion was knocking me into an NFP class after several years of marriage and two kids? Five kids now. My hubs is a 3rd Degree Knight of Columbus; he gets the monthly KOC magazine, Columbia. On the back cover, there’s always a vocation story from a religious; I love reading these. Almost all of them have moments of deep doubt – Why me? or How me? – but they give themselves over and listen to the call of God. Quick preface.. I’m agnostic and no I will not ever accept a ‘god’ in as much as I would never accept a ‘santa clause’ without express direct scientific proof. That said, why did he go back to this particular strain of christianity? Why not pentecostal, catholic, latter day saint, you name it. For that matter why not allah or buddah? Answer is very simple. He simply lost his mental foundation and decided to follow the rest of the herd. His friends, relatives practice the religion and so he felt compelled to follow the same path and again be the ‘beloved brother’ in christ etc. He was seeking acceptance from his midst and only way to get it was to convert and accept their ideology. Very simple. I’m kind of shocked whenever I read otherwise seemingly intelligent human beings submit to superstitious beliefs… especially in this day and age. Vladb — good to know that the faith of Thomas Aquinas is simply insufficient for your towering intellect.